This is the fifth cognitive bias covered in this quarterly newsletter. I would guess that nearly every financial advisor has seen this bias played out in his or her clients, and you almost certainly do some mental accounting, yourself—and probably for good reason, but mental accounting can be problematic. Here’s an example of mental accounting from the book, Misbehaving, by Richard Thaler. Imagine that you have decided to see a play and paid the admission price of $10 per ticket. As you enter the theater, you discover that you have lost the ticket. Would you pay $10 for another ticket? Now imagine that you have decided to see a play that costs $10 per ticket. As you enter the theater, you discover you have lost a $10 bill. Would you still pay $10 for a ticket? When he conducted this study, 46% of respondents to the first question said yes. To the second question, 88% said yes, but the economics were the same in both cases: the subject was out $10. Budgets, which we highly recommend to clients, and use ourselves, are another form of mental accounting. The $20 bill in your Utilities envelope can just as easily be spent on dinner out or put toward groceries, but we create budgets as spending guardrails. 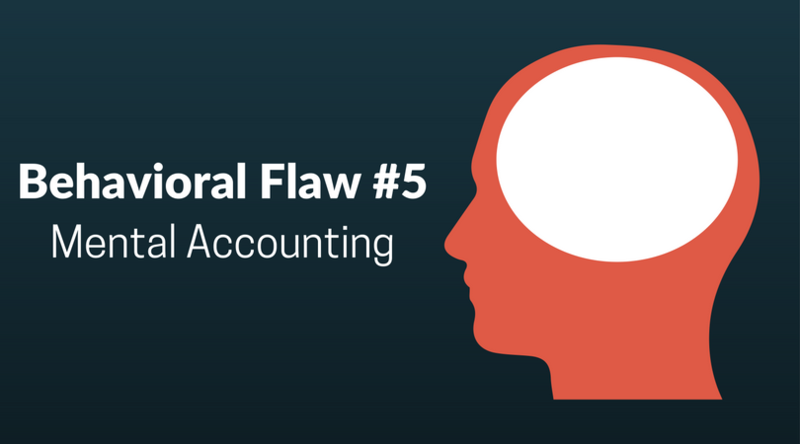 For an example of mental accounting that can get one in trouble, consider the cost basis of an investment. Aside from taxes, what does one’s cost basis have to do with sound investing? A stock selling for five times the $2,000 one paid for it is no more or less valuable than the stock selling for one-fifth of the $50,000 one paid for it. In both cases, the stock is worth $10,000. Yet, absent tax considerations, we are far more loathe to sell the stock in the second case. So, what are some practical steps investors can take to defend against this potentially-ruinous cognitive foible? When looking at a statement, cover up the cost column. Some online account views allow columns to be hidden or de-selected; do so. Consider using stop-loss orders, which execute once a certain price is reached. These are not perfect, as they can execute far below the stop-loss price. The opinions voiced in this material are for general information only and are not intended to provide specific advice or recommendations for any individual. Stock investing involves risk including loss of principal.